Why not let me act as your Buyer Agent and help reduce that stress? Bernadette Denby would be delighted to act as your buyer’s agent at all stages of the buying process. Bernadette will establish exactly what are your needs with this information she will then shortlist a number of properties for you, send you the property details and give you her opinion on each. If you are interested in one or more of those properties, Bernadette can arrange to attend a viewing on your behalf, report back to you either by phone or email and then if you are happy to proceed, she will negotiate the purchase of the property on your behalf. After the property is sale agreed Bernadette can then organise on your behalf a Surveyor to carry out a structural report and where appropriate, a bank valuers report, she will monitor and keep you updated every step of the way. Bernadette is a member of BNI Ireland a business networking group which gives her an fantastic panel of people to refer to for your needs such as solicitors, surveyors, architect’s, insurance, decorators, garden maintenance, cleaning services, etc., she would be happy to match the person with your specific needs. 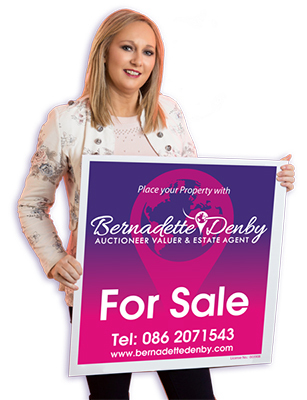 Once your purchase is complete, Bernadette Denby Auctioneer Valuer & Estate Agent can provide you with an excellent Letting and Management service at very competitive rates, assist you in any organising, refurbishments or repairs that may be necessary for an agreed budget.